Vitamin E is one of the important vitamins that humans need for good health, and it was an easy matter to find a tester willing to test these soft-bodied capsules. Some of the benefits of taking this supplement include maintenance of eyes and skin, strengthening of the immune system and it is best known as an antioxidant, which protects cell membranes. Holland & Barrett claim that taking Vitamin E ‘contributes to the protection of cells from oxidative stress’, not mentioning any of the other known benefits of the product. However, oxidative stress is understood to be linked to cancer and protecting one’s cells from the process of oxidation is a strong, standalone reason for taking the supplement. 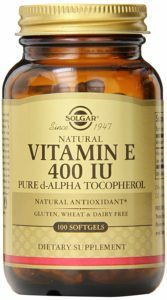 Our tester took the small yellow bottle of vitamin E Supplement by Solgar home and, after forgetting to take the capsule regularly for a day or two, soon settled down into taking one capsule per day, with his breakfast. After a fortnight of regular ingestion, he took stock of himself. The first change he noticed was mostly cosmetic: his hair seemed to be thicker and glossier. He also realised that his seasonal issue with colds and sniffles had not given him its usual troubles – he tended to suffer from hay fever and chronic mild sinusitis. Otherwise he could not pinpoint any specific improvements in his health, but he did admit that he ‘felt better’ in general: he had more energy, he was sleeping better and enjoying his work more than usual. These soft translucent capsules are, as promised, odourless and tasteless, so there is no chance that they will ‘repeat’ on the user. They are easy to swallow and caused no issues at all. Our tester has a wide variety of different foods for breakfast and had no issues at all with the capsules: no taste or digestive issues as a result of taking this supplement. The capsules are soft and small enough to swallow easily. If held in the mouth, the skin begins to dissolve slightly and can become tacky and hard to swallow, but there is no reason to hold the capsule in the mouth for long enough for this to be an issue. There are only ingredients: Vitamin E, the capsule is made from gelatine and glycerine and the vitamin is suspended in soya bean oil. Anyone who is allergic to any of the ingredients will no doubt steer clear, while most other people should be fine to take them. 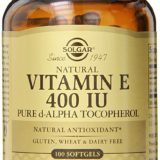 For nearly twenty pounds, the Vitamin E Supplement by Solgar is not a cheap item to add to the grocery shopping, but divided by the just over three months that a bottle will last, it comes down to a more manageable, but still expensive £5-or so per month. These are not a cheap addition to your dietary regimen, but our tester recommends that you try them for a couple of weeks and see the difference in how you feel: you may easily decide that the price is worth it for the added health benefits.